With 2 toddlers mostly at home (not in regular MDO or preschool yet), we have A LOT of kid dishes to deal with. That’s 3 meals, 2 snacks, and countless drinks each day TIMES TWO. Now that they are now toddlers, they get responsibilities like helping get their own dishes/cups/silverware out. We used to keep plates in an upper cabinet in simple office sorters (like this one). This is a great option for keeping plates in a cabinet with a door whether it’s an upper or lower cabinet. 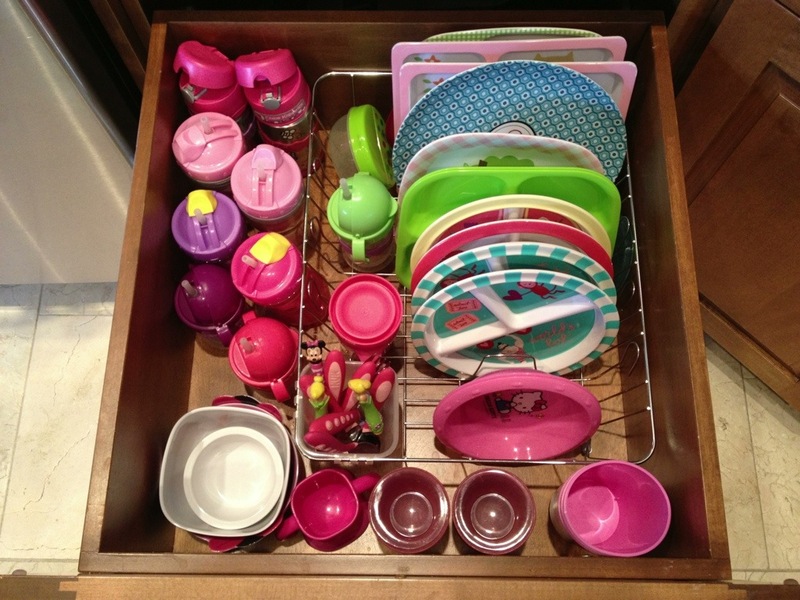 In our kitchen, it worked out best to designate them a large drawer to keep all “kid dishes” in. It’s close to the dishwasher, sink, refrigerator, and our regular dishes so it’s convenient, AND it’s in their reach so they can help put things away and get things out. They did experiment with pulling everything out a few times, but that awesome activity lost it’s luster when I did my best to not react and it made driving Cozy-coupes through the kitchen more difficult. To maintain some order over the chaos, the folder sorter really didn’t work in the drawer. It wasn’t heavy enough to keep from sliding around and the plates kept rolling off. 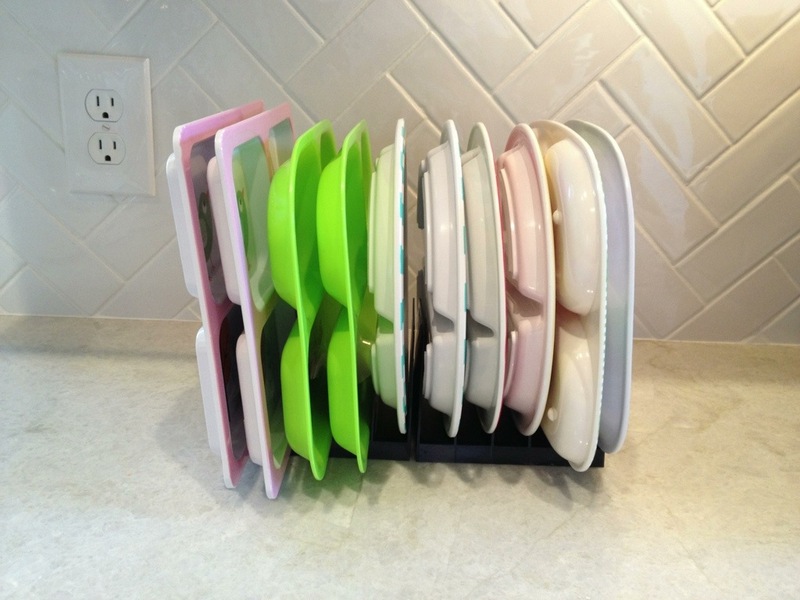 On impulse while out shopping, I decided to try a dish drying rack (similar to this one). 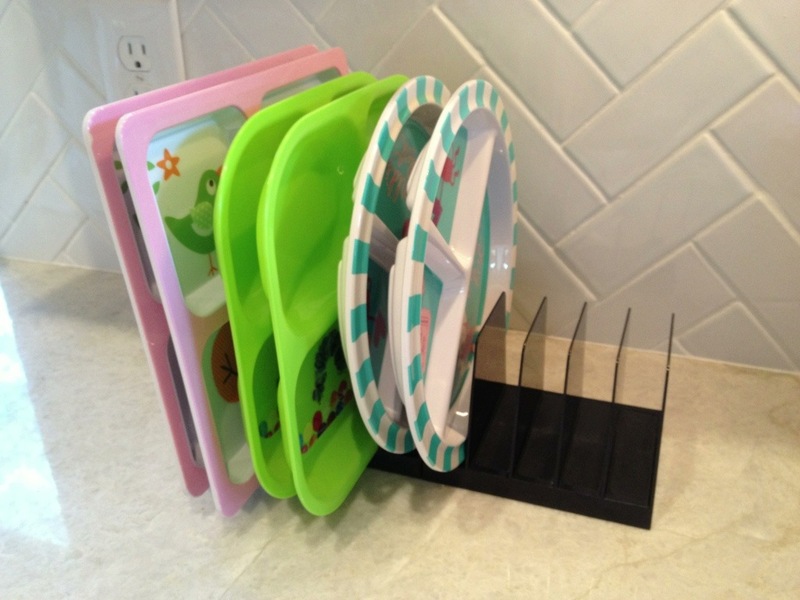 It works beautifully at keeping plates & bowls in order, has a handy cubby for forks & spoons, and sippy cups & snack bowls fit nicely around it. Voilá! Mess of toddler plates, bowls, cups, forks, and spoons officially under control. The real test is to see if it’s easy to maintain. It doesn’t matter how organized and pretty a solution is unless it actually works. This is what this draw looks like regularly (no need to tidy the drawer to take this photo) so it worked for us! What kid space has been the biggest challenge to organize in your house?